The explosive and sensual story of a Victorian woman's sexual awakening - now told for the first time. In her award-winning film The Piano, Jane Campion told a love story so stunningly original that it transfixed millions of film-goers all over the world. Although she had already spent ten years writing and making the film, Campion continued to be haunted by her characters and decided to tell the whole story. 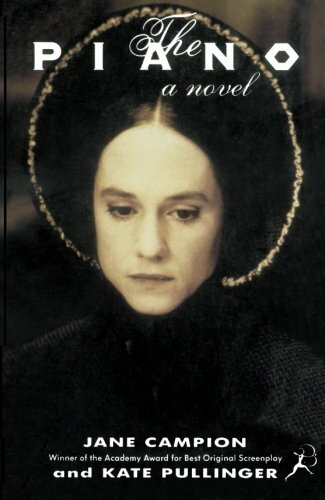 Delving deeply intot the character's pasts, the novel reveals why Ada has stopped speaking, the history of the piano, and the secred of Flora's conception. We also find out about Baines's mysterious past, and discover what lies behind Stewart's stark loneliness. I've never seen the movie and - to be honest - I bought the book just for the title. I found the story to be verry gripping and I read the book in one sitting. In my mailbox today. Thanks. I have seen the movie several times. The last time was only two weeks ago on France 3 *), probably broadcasted that particular week, because of the Cannes Film Festival (it won the Golden Palm in 1993). I loved it again, in spite of the French voiceover. I always had some question marks though. Some were filled in, when watching it a second or third time. It has several layers and beautiful symbolic scenes. You keep on discovering new things, you did not notice the previous time you watched it! One of Jane Campion's accomplishments as a director. Some questions still remain though. This book promises to tell "the whole story", so I'm very curious to see if they will be answered. The main reason for joining this ring. Normally I never read a book after having seen the film. Besides: The film was not adapted from a novel; it was originally a screenplay. We'll see. Up next, as I just finished my current read. Finished reading yesterday. A quick read on a rainy afternoon. Most of my questions have been answered now! If you have seen the film, this is a nice way to get more background information about the main characters; facts about their previous lives, the movie does not mention (and probably for a reason! These mysteries are part of its charm, I guess). If you haven't: Go get that DVD! You won't regret it. I myself prefer it to the book, by far. Will travel to redfloor soon. Thank you for sending this book. I hope to read it soon. I always wanted to see this movie, so I started with the book. I thought the book was okay, but I still want to see the movie. I'll send it to Afraberg. Yesterday this book arrived in my mailbox and I started reading today. Thank you very much for sending this book Redfloor! And E-J-V thank you very much for making this book a bookring! What a very dark atmosphere in this book! But I liked it very much, although for me it was hard to understand the Victorian morality and social structures. I've sent the book to Plinius today. in today's post, thank you Afraberg, and also for the nice card and magnet! I had seen the film some time before I read the book and to me the film was somewhat unsatisfactory because of the lack of background of the three main characters. The book remedies that, and it matches the film in beauty and atmosphere. Thanks for ringing, E-J-V! The book arrived today, with a slight detour. I refrained from reading the other journal entries, even though I know you wouldn''t give away spoilers. I can''t wait to start reading this book. I have seen the film, several times, it is one of my all-time favourites. This book seems like the script of the director''s cut, made into a book. The information on the background of Ada, Baines, Stewart and Flora is the total of deleted scenes from the film. The only thing I missed is the amazing landscape. So, it was just like watching a favourite movie again, hearing the music and their voices in my head. Just like Stewart did... and I enjoyed that very much. Thank you for making this book available! Let''s see, who is the next one on the list? Thanks everybody for participating. I really enjoyed reading all your JE. from the meeting at SylS´. This book gets a job in the course of English at the community centre.